Choose foundation 2 or 3 shades darker than your natural skin tone. If using a liquid foundation, use a powder bronzer with a soft kabuki brush. Start with the forehead frame and go down keeping the color high. Lightly brush around the jaw line and make sure to apply it down the neck. Your neck is the palest part of your body. To finish a bronzer look take a gold pigment and use it to add extra highlights to your face. This will give extra glow. Use a pointed brush or a liner brush on the inner eyes, top lip bow and under the brow bone’s edge, centre of the eye ball and top of the cheek bone. Finish with a stained look lips, the same look of a little girl’s lip. 1. 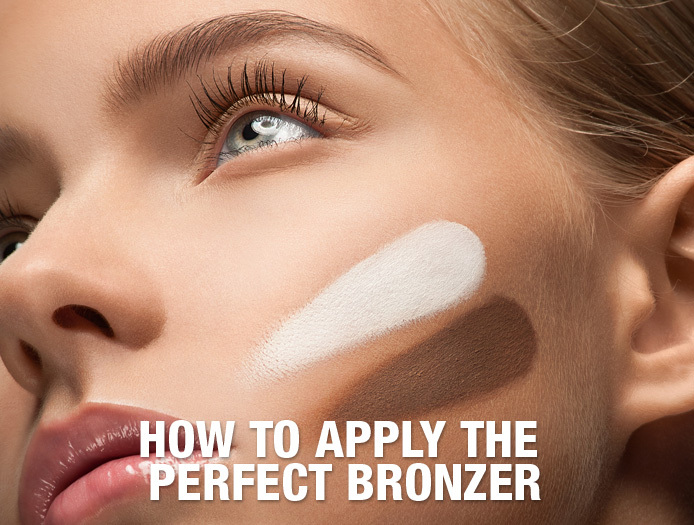 Choose a bronzer 2-3 shades darker. 6. Always make sure you blend well.